The Navy uses different types of trucks. The use depends on the base, type of aircraft assigned, and anticipated types of fires. Some of the trucks used by the Navy are the Oshkosh T-3000, the P-4A vehicle, the P-19 fire-fighting truck, and the P-25 shipboard fire-fighting truck. Shore-based Twinned Agent Units (TAUs) and Shipboard Twinned Agent Units (SBTAUs) are also used. OSHKOSH T-3000 The Oshkosh T-3000 (fig.12-8) is a diesel- powered, six-wheeled-drive truck with an automatic transmission. The operator controls consist of power-assisted steering, air or mechanical brakes, transmission range selector, and in-cab controls for operating the fire-fighting system. The water storage tank has a capacity of 3,000 gallons; the AFFF concentrate tank holds 420 gallons. The roof turret has a discharge rate of 600 to 1,200 gpm and an infinitely variable pattern from straight stream to fully dispersed. The bumper turret is electric joystick controlled with auto-oscillation. The discharge rate is 300 gpm and it is also variable pattern. Two 15-foot, 1 3/4-inch preconnected handlines are provided, one per side. The handlines have a discharge rate of 95 gpm and have a pistol grip with variable pattern. P-4A VEHICLE The P-4A vehicle (fig. 12-9) is diesel powered with an optional all-wheel drive. It has a six-speed, semiautomatic, power shift transmission. The operator's controls has power-assisted steering, air- over-hydraulic power boost brakes, transmission range selector, and in-cab controls for operating the vehicle's fire-fighting systems. The water storage tank has a capacity of 1,500 gallons. The AFFF concentrate pumps (centrifugal) are powered by the truck engine by means of power dividers. The concentrate and water are carried to each of the discharge points in separate lines and are mixed in venturi inductors before discharge. The P-4A is provided with a manually maneuvered, 750-gpm constant-flow, variable-stream roof turret. The P-4A is also provided with a 250-gpm bumper turret mounted in front of the cab and controlled hydraulically from within the cab. 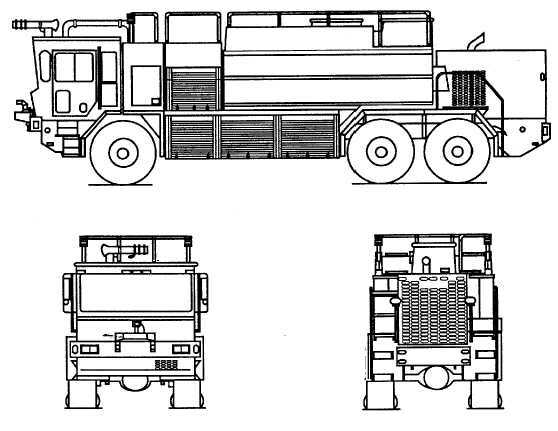 The handline is mounted in front center of the vehicle in a compartment 12-9 Anf1208 Figure 12-8.T-3000 aircraft fire-fighting rescue vehicle.